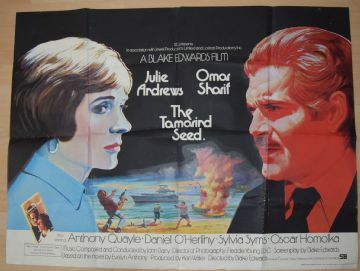 Tamarind Seed (1974) UK Quad 30" x 40"
Blake Edwards directs this great little film about a British Civil Servant who, whilst on holiday, falls for a Russian agent. The film stars Julie Andrews, Omar Sharif and Anthony Quayle. The poster has lovely artwork of the two main stars and shows only a pinhole in each corner and some light fold wear on the right hand side.